The NLRA's final road trip of the 2013 season features its' customary Labor Day double header at the Viking Speedway in Alexandria, MN, this year featuring a new twist. Action will begin on Saturday night, August the 31st, with the series' 30th appearance on the Douglas County Fairgrounds half mile oval. On Sunday night, September the 1st, the series will take part in the speedway's inaugural '4444' race, where 26 drivers will have a chance to win $4,444 for winning the 44 lap main event. 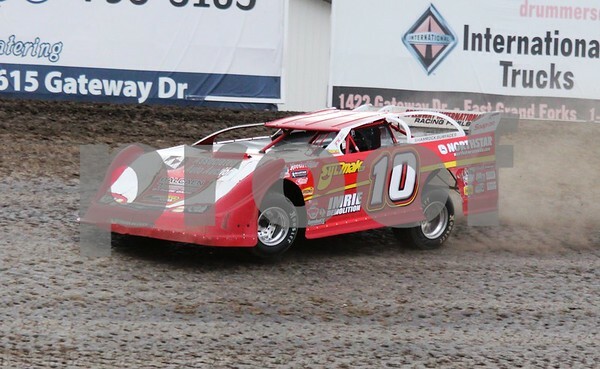 Bill Mooney captured his second career NLRA series feature Saturday night at the Devils Lake Speedway near Doyon, ND. Mooney held off charges from Brad Seng and Pat Doar, leading all 25 laps of the main event. Donny Schatz used a last lap pass on Joey Pederson to win Friday nights' NLRA show at the River Cities Speedway in Grand Forks, ND. Schatz also lead every lap of the World of Outlaws sprint car main event. Photo courtesy of Rick Rea. 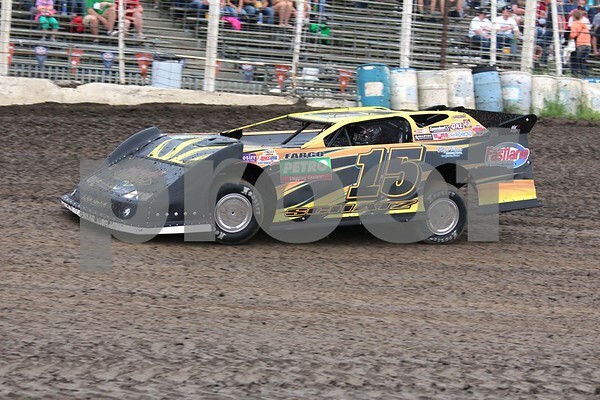 The busy month of August continues this weekend for the NLRA, and its' series regulars with a return trip to the River Cities Speedway, and its' lone trip this season to the Devils Lake Speedway. Friday night, August the 16th, the NLRA makes its' second appearance of the season at the River Cities Speedway in Grand Forks, ND. Joey Pederson, driver of the No. 7P Dahlstrom Motors Mars MB Custom has three wins at the speedway this season, including the NLRA series race on June 21. Zach Johnson won his third NLRA feature of the 2013 season Sunday night at the Buffalo River Race Park near Glyndon, MN. The win was also Johnson's 10th NLRA series victory tying him with Ricky Weiss and Jeff Wildung for fifth on the all time wins list. Kent Arment scored his second career NLRA feature victory Thursday night at the Norman County Raceway in Ada, MN. The win was his first with the NLRA since June 26, 2004 when he bested the NLRA series regulars at his home track during the series' only event to this date at the Brown County Speedway in Aberdeen, SD. Arment started thirteenth in the main event, and took the lead on lap 25.